Is this budget iPhone leak a ruse to flog a cheap Android knock-off? There seems to be little doubt now that Apple intends to launch a more affordable iteration of its iPhone handset, but, as the old saying goes; seeing is believing. Well, after months of speculation and purported plastic cases leaking out into the wild, one tech site claims to have got some hands-on time with the finished article and posted pics and video as supposed proof. The Techdy blog has showcased an extensive gallery of a white handset with a polycarbonate shell, bearing the Apple logo and a well-polished video claiming to showcase the device in all its glory. The site doesn't say how it got hold of the device, which features a thinner-than-usual bezel, lightning port, but there's enough in the text to warrant a healthy dose of cynicism. 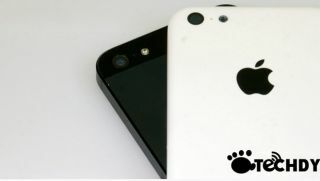 Later in the post, written by the editor of the M.I.C gadget blog, readers are invited to check out and buy the 'Basic Bear,' an Android phone 'inspired by the design' of the so-called budget iPhone. Regardless of the validity of the leak, the photos and video (which can be viewed here) offer an interesting interpretation of what the cheaper iPhone may look like if and when Apple launches the device. Will the budget iPhone come in all the colours of the rainbow? One leak suggests so.